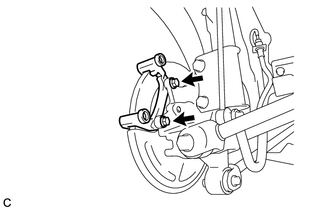 (a) Remove the union bolt and gasket, and disconnect the rear flexible hose from the rear disc brake cylinder assembly. 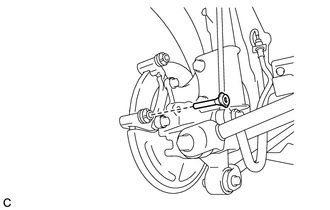 (a) Remove the 2 bolts and the rear disc brake cylinder assembly from the rear disc brake cylinder mounting. 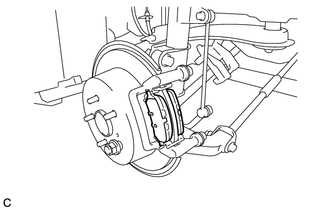 (a) Remove the 2 rear disc brake pads from the rear disc brake cylinder mounting. (a) Remove the 2 rear anti-squeal shims and the pad wear indicator from the inner pad. 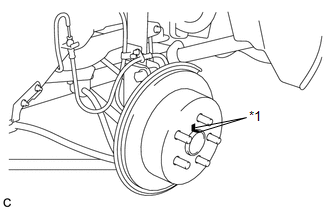 (a) Remove the 2 rear disc brake pad support plates from the rear disc brake cylinder mounting. (a) Remove the No. 1 rear disc brake cylinder slide pin from the rear disc brake cylinder mounting. (a) Remove the No. 2 rear disc brake cylinder slide pin from the rear disc brake cylinder mounting. 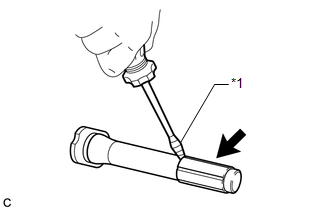 (a) Using a screwdriver with its tip wrapped with protective tape, remove the rear disc brake cylinder slide bushing from the No. 1 rear disc brake cylinder slide pin. Be careful not to damage the No. 1 rear disc brake cylinder slide pin. 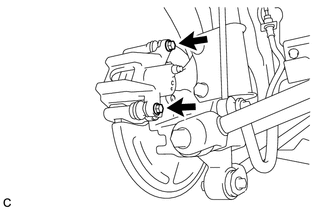 (a) Remove the 2 rear disc brake bushing dust boots from the rear disc brake cylinder mounting. 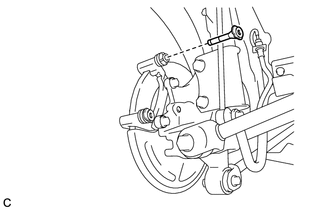 (a) Remove the 2 bolts and the rear disc brake cylinder mounting. (a) Put matchmarks on the rear disc and rear axle hub. 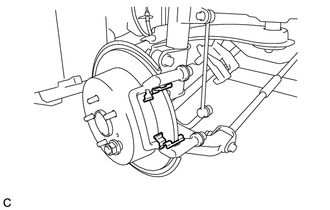 The above step is not necessary when the rear disc will be replaced. 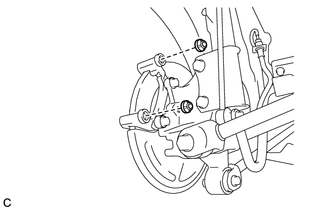 (b) Release the parking brake and remove the rear disc. 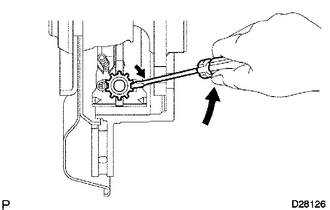 If the rear disc cannot be removed easily, insert a screwdriver through the service hole to loosen the parking brake shoes by turning the adjusting screw. (a) Remove the rear disc brake bleeder plug cap. 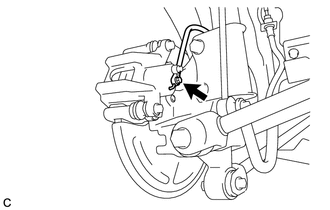 (b) Remove the rear disc brake bleeder plug.